The Spanish fir has two subspecies distributed in southern Spain and northern Morocco where threats include fire, grazing and climate change. Tree to 30m tall, d.b.h. 1–1.5m; trunk straight but sometimes forked or twisted; crown narrowly conical in young trees and irregular in mature trees. Bark smooth and dark grey in young trees, rough and scaly in old trees. Branches, lower curved downwards, uppermost ascending, branchlets very rigid, reddish brown or greenish brown, vegetative buds ovoid–globose, 5–-6 x 4–4.5mm, greenish to purple-brown. 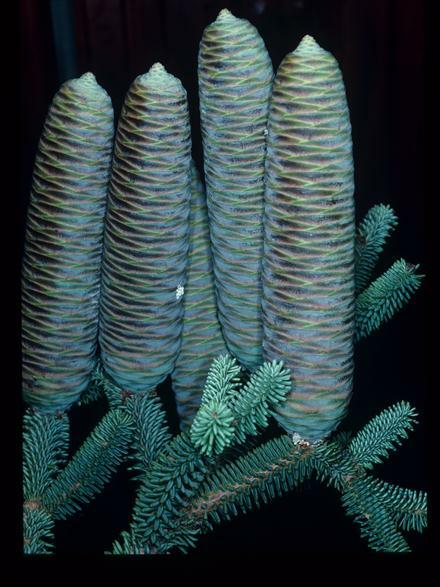 Leaves spirally arranged all around shoot, those below bent backwards; 1–1.8cm, leathery, stiff, bluntly rounded; dull grey–green or blue–grey with two broad stomatal bands of grey–green or dull bluish white on each surface. Female cones 9–14cm x 3–4cm, abruptly narrowed to apex, greenish purple when immature, ripening dark or light brown. Male cones crowded along underside of shoot, dark brown, opening cherry–red. Abies pinsapo comprises A. pinsapo var pinsapo, native to southern Spain and A. pinsapo var. marocana, native to north Morocco. These are treated on separate pages. Abies pinsapo occurs in two disjunct areas of the western Mediterranean in: Spain: here the typical variety occurs in three subpopualations in Sierra del Pinar (Province of Cádiz), Sierra de las Nieves and in Sierra Bermeja (Province of Málaga). It has an extent of occurrence of 940km² with an area of occupancy of 28.7km²; Morocco: represented in the Rif Mountains by A. pinsapo var. marocana where it has has an estimated extent of occurrence of 75km² with an estimated area of occupancy of 28km². In Morocco Abies pinsapo occurs in the Mediterranean humid bioclimatic zone. The average annual rainfall is 1500mm, increasing to 1,900mm at an altitude of 1700m. Stands are typically found on north facing dolomitic limestone slopes of mountain ridges. The optimal altitudinal range is between 1400 and 1800m, where it forms mixed forests with a range of oaks and maples. Between 1800 and 2000m Abies occurs with Cedrus atlantica, Pinus nigra and Pinus pinaster. Above 2000m the mountain summits are typically dominated by shrubby xerophytic species. In southeastern Spain Abies pinsapo occurs on dolomitic soils in the Sierra de Grazalema and Sierra de las Nieves but on serpentine soils in the Sierra Bermeja. Forests occur at altitudes between 900 and 1600m . Above 1100m its forms dense, pure forests, but below this altitude trees occur in mixed communities with a range of oaks and pines. 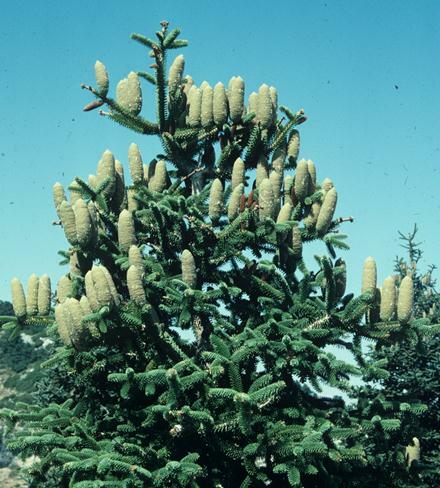 Abies pinsapo has a very limited distribution and a restricted habitat in small areas of Spain and Morocco. The total extent of occurrence (EOO) has been estimated to be 3727km², while the area of occupancy (AOO) is considerably less than 500km². The number of locations is five and there is a decline in the quality of habitat in significant parts of its range. In Spain the major threat is fire. Other threats include pests and diseases which are more apparent during drought years when forests are more stressed. During the last decade (1990s) a regional warming trend and a decrease in precipitation has been observed. These changes have been associated with increasing mortality of trees at elevations below 1100m (Linares, 2009). In Morocco, fire is also a major threat. Deforestation and habitat degradation associated with cannabis cultivation in the areas surrounding the fir stands are additional threats. More detailed information is given in the assessment for each variety. There are currently no accurate figures for the total number of mature individuals over the full extent of its range. The Moroccan subpopulation is considerably smaller than the Spanish subpopulation. 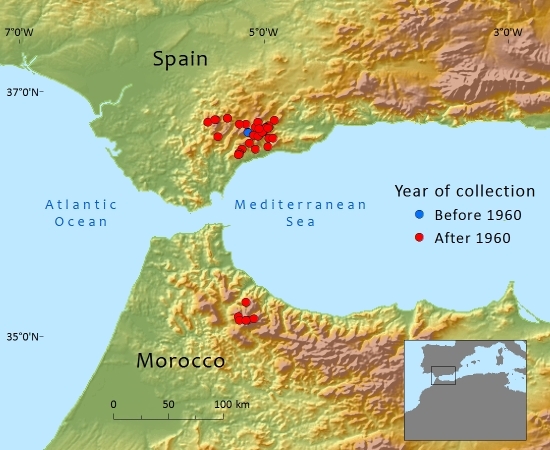 Recent genetic studies (Terrab et al., 2007) have indicated that the Spanish and Moroccan varieties have been isolated for considerable periods of time and that there is little, if any, gene flow between them. The majority of stands are now within various protected areas in Spain and Morocco. In 2006 these protected areas were included in the first UNESCO Intercontinental Mediterranean Biosphere Reserve. In Spain Abies pinsapo var. pinsapo is also protected at a regional level under the Spanish law. At the European level, A. pinsapo forests have been included in the Habitats Directive (92/43/CEE). More detailed information is given in the assessment for each variety. 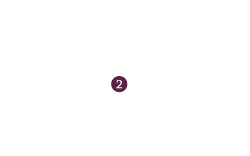 Arista, A., Alaoui, M.L., Knees, S. & Gardner, M. 2011. Abies pinsapo. In: IUCN 2012. IUCN Red List of Threatened Species. Version 2012.2. . Downloaded on 07 March 2013. Arista, M., Herrera, F.J. & Talavera, S. (1997). Biología del Pinsapo. Junta de Andalucía, Consejería del Medio Ambiente, Seville, Spain. Arista, M., Talavera, S. & Herrera, F.J.(1997). Abies pinsapo: a protected especies in a protected area. Bocconea. 7: 421-436. Aussenac, G. (2002). 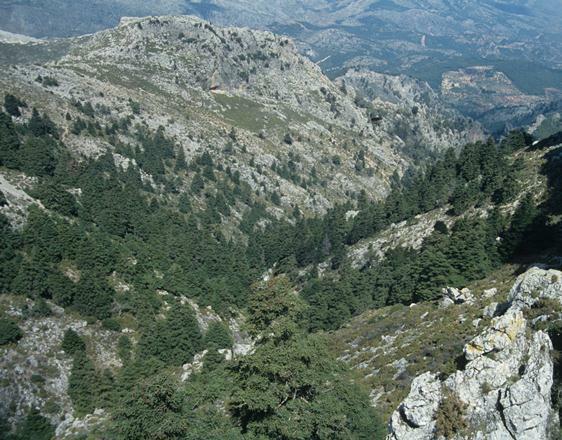 Ecology and ecophysiology of circum-Mediterranean firs in the context of climate change. Annals of Forest Science, 59, 823–832. Barbey, A. (1931). A Travers les Forêts de Pinsapo d’Andalousie: Étude de Dendrologie, de Sylviculture et d’Entomologie Forestière. Librairie Agricole, Paris, France. Emberger, L. (1939). Aperçu général sur la végétation du Maroc. Veröffentlichungen des Geobotanischen Instituts, Eidgenössische technische Hochschule Rübel in Zürich 14: 40-157. Esteban, L.G., De Palacios, P. and Rodriguez-Losada Aguado, L. (2010). Abies pinsapo forests in Spain and Morocco: threats and conservation. Oryx 44(2): 276-284. Fennane, M. & Ibn Tattou, M. (2005). Flore vasculaire du Maroc : inventaire et chorologie. Trav. Inst. Sci. Rabat, Rabat. Fennane, M., Ibn Tattou, M., Mathez, J., Ouyahya, A. & El Oualidi, J. (1999). Pteridophyta Gymnospermae, Angiospermae (Lauraceae-Neuradaceae), Flore pratique du Maroc: manuel de détermination des plantes vasculaires, Vol. 1. Rabat Institut Scientifique, Rabat. Génova Fuster, M. (2007). El crecimiento de Abies pinsapo y el clima de Grazalema: aportaciones dendroecológicas. Investigación Agraria: Sistemas y Recursos Forestales 16(2): 145-157. Hmamouchi, M. (1999). Les Plantes Medicinales et Aromatiques Marocaines. Imprimerie de Fedala, Mohammedia, Morocco. Linares, J.C., Camarero, J.J. and Carreira, J.A. (2009). Interacting effects of changes in climate and forest cover on mortality and growth of the southernmost European fir forests. 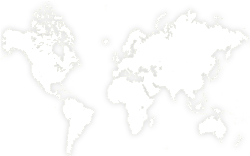 Global Ecology and Biogeography 18: 485-497. Moore, H.M., Fox, H.R., Harrouni, M.C. & El Alami, A. (1998). Environmental challenges in the Rif mountains, northern Morocco. Environmental Conservation 25(4): 354-365. Quezal, P. (1983). A system of terrestrial biosphere reserves for the Mediterranean, in : UNESCO Man and the Biosphere (MAB) Programme, First International Biosphere Reserve Congress. MINSK-BSSR-USSR, 26 September-2 October 1983. Royaume du Maroc (1996). Census nationale. Database. Direction de la Statistique. Rabat, Morocco. Terrab, A., Talavera, S., Arista, M., Paun, O., Stuessy, T. F. & Tremetsberger, K. (2007). Genetic diversity at chloroplast microsatellites (cpSSRs) and geographic structure in endangered West Mediterranean firs (Abies spp., Pinaceae). Taxon 56(2): 409-416. Valdés, B., Rejdali, M., Achhal El Kadmiri, A., Jury, S. L. & Montserrat, J. M. (2002). Catalogue des plantes vasculaires du nord du Maroc, incluant des clés d’identification, vol. 1. Consejo Superior de Investigaciones Científicas. Madrid. M. Arista,M.L.Alaoui,S.G.Knees,and M.F.Gardner, 2016. Abies pinsapo, from the website, Threatened Conifers of The World (http://threatenedconifers.rbge.org.uk/taxa/details/83).